Reviews of the top family hotels around Sandusky, Ohio — a classic Midwestern family destination of themeparks and waterparks near Lake Erie. Ohio’s Ottawa County may be best known for the town of Sandusky, home to the world-famous Cedar Point amusement park, but this low-key Midwestern county has much to offer families traveling with kids of any age. Almost any hotel in this car-friendly region provides a good base to explore the shores of nearby Lake Erie as well as many Midwest attractions. 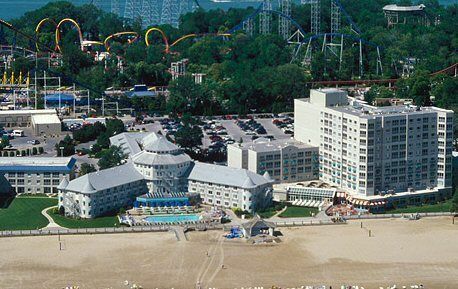 If you are planning a few days at Cedar Point Amusement Park, however, it’s worthwhile booking one of their hotels. Cedar Point, one of the largest local real estate holdings, is now offering discounted admission to any guests staying at a Cedar Point resort. Admission in 2011 to the park for resort guests 48” and taller is $29, while admission for guests under 48” or older than 62 years of age is $21 — nearly a $20 savings per adult. Hotel guests get priority entrance to the parks as well as discounted entry tickets, so do check out the exclusive deals and discounts at Cedar Point online. 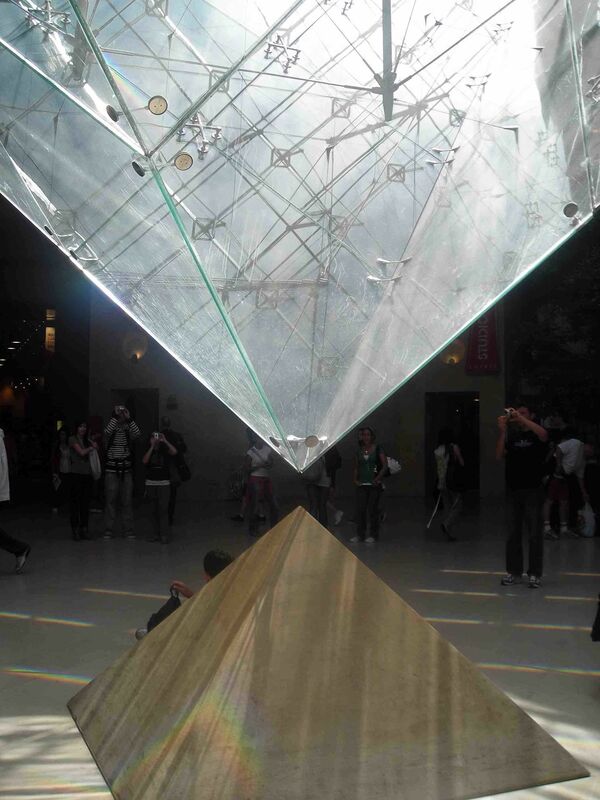 And of course, the hotels are very nice, and convenient to the area’s other attractions. 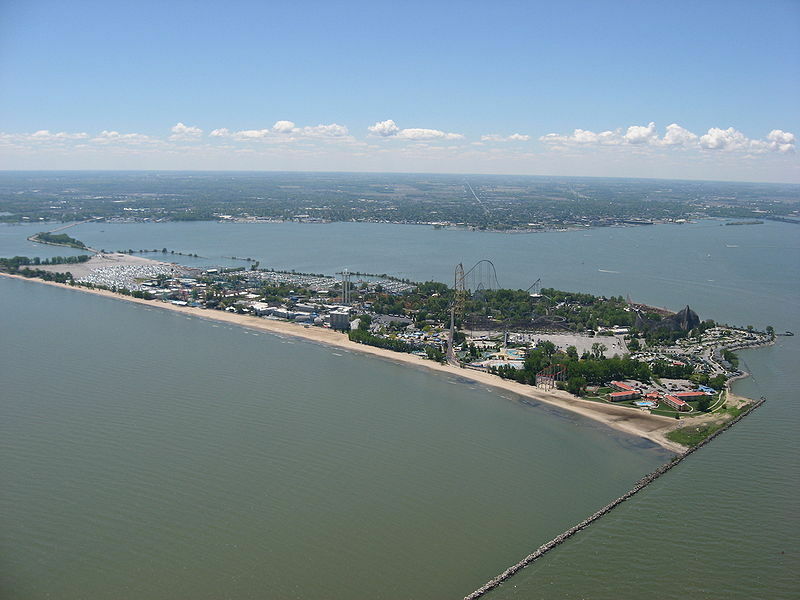 The Cedar Point owned properties can be explored and booked online at Resorts of Cedar Point (419/627-2106) whose address, for GPS purposes, is 1 Cedar Point Drive, Cedar Point, Sandusky, OH 44870. The themepark resort’s the top hotel is the classic, ca. 1905 lakefront Breakers (419/627-2106), whose two additions have expanded it to 650 comfortable, modern rooms (from $150-$245/room sleeping four.) Gone are the days when presidents and Hollywood moguls came a’calling; today, the place is jammed with bus tours and family reunions. The three swimming pools, thrill ride views, Tiffany stained-glass rotunda lobby, 50’s-style ice cream shop, and the brief boardwalk stroll into the park make it very appealing to families. For 2011, rates are $-$$ for a double room sleeping four. Another choice is Lighthouse Point (419/627-2106) by the resort’s marina. This is the place if you and all your relatives plan to stay awhile, because it has 64 cottages and 40 “quaint” style purpose-built cabins around the historic Cedar Point Lighthouse (circa 1862), the oldest existing structure on the Cedar Point Peninsula. The cottages are one-story, lakeside units with a private deck and sleep up to six people with a double bed and bunk bed in the bedroom and a futon/sofa in the living area. The cabins are one-story units with a loft area, situated inland around a small pond and sleep up to eight. At both you can barbecue or cook your own meals inside. The Sandcastle Suites Hotel (419/627-2106) is another good choice, a newer all-suite property favored by larger families. The 187 two-room suites can sleep six and are priced from $$-$$$, plus there’s a tennis court located along the lakefront ‘beach’ within a five-minute’s walk of the park. Cedar Point extends their season of fun with Castaway Bay (419/627-2106), a waterpark resort. The hotel has 237 bright, comfortable rooms and suites with balconies, giving everyone a chance to get some fresh air. Within the rooms you’ll find a minifridge, coffeemaker and microwave and Internet access. Plan to check in early so you can enjoy a full day of fun in the 38,000-square-foot, tropical-themed indoor waterpark, open daily. The hotel also has a game room and large arcade, fitness center for ages 16+ and a more ordinary pool and Jacuzzi. Other family-friendly touches include soda machines, an ATM, guest laundry, luggage storage and day lockers for check-out day. You may want to settle here for a few days, as supervised kids’ programs include Camp Castaway, open daily, with drop-in crafts and other activities by day, and games, dance parties and movies in the evenings. Unless you’re camping, the greatest savings can be had at The Breakers Express Hotel (419/627-2106) which is located about 2 miles from the park in a not very interesting area with some fast food restaurants. There are other, cheaper choices in the basic motel category, but this one’s often bundled with great ratse for Cedar Point entry tickets. 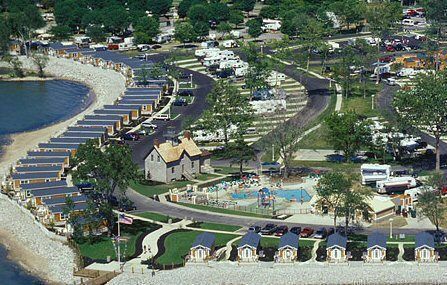 For families who love to camp or those traveling in an RV, Camper Village is an RV campground conveniently tucked between the tides of Lake Erie and the park’s entrance. Camper village offers over 100 sites that include both electricity and water. Leashed pets are permitted. Great Wolf Lodge (800/641-9653), a well-known Midwestern waterpark company, put their first Northwoods-themed indoor waterpark in this town that draws thousands of families each summer. It’s an early version of this chain’s fun decor — elk antler chandeliers, Native American totems, and life-size replicas of timber wolves. The lobby is festooned with other forest-abilia designed to get your cubs in a playful spirit right away. The indoor waterplay area is smaller than some of their newer resorts, but still great fun. For us, it’s equally fun after an exhausting day of sightseeing to have an on-site program for young children. Counselors man a video arcade, crafts room, Pajama Storytime in the lobby, and play areas, though parents are expected to stay with their children. Unlike the fair weather themeparks, this resort offeres an easy, weather-proof vacation that’s toddler- to teen-friendly at any time of year. 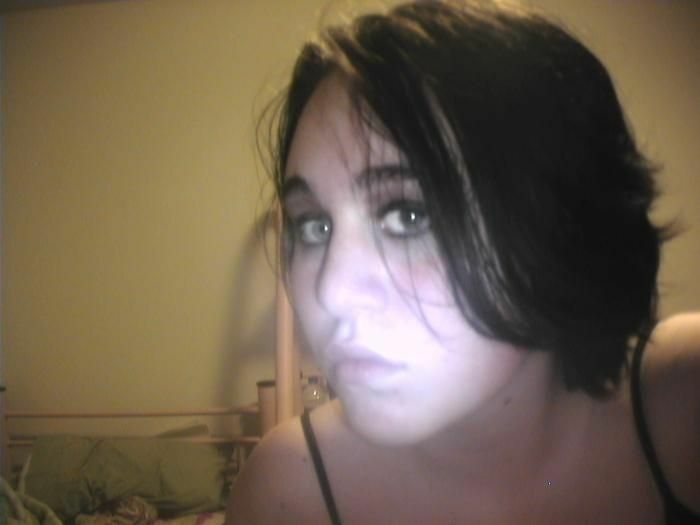 Not for a tight budget, with 2011 rates from $$-$$$. While the Kalahari Water Park Hotel is newer and has a much larger indoor waterpark, early reviews are very mixed. (419/621-9500) is TripAdvisor’s top choice for the area, and it’s well regarded for its budget rates (about $ per night) and good continental breakfast. Like our other picks, it has a pool, is very well kept and it’s convenient to the area attractions. Families with teens will want to request one of the double rooms with two beds and a queen sofabed, a top value. The Econo Lodge Sandusky (419/627-8000) is another motel in a strip of fast food restaurants, about 2 miles from the themepark near the Edison Birthplace. This very basic place gets high marks for its cleanliness and friendly staff. It’s convenient to the attractions of Sandusky and is priced at a very welcoming rate of less than $ per night, including continental breakfast and WiFi internet access. Best yet, the large rooms have clothes racks that make it easy to dry the kids’ suits once you’ve come in from the heated outdoor pool.